The rain can't stop this swim parade. Grab the goggles and dive sticks and head for the indoor pool and hot tub. A few afternoons at the pool, and you may have to download a few more must-reads. Find a spot on the landscaped grounds and see if you can remember which of your packed sandwiches had mustard. Long dinners, late-night card games, a semi-impossible puzzle. What'll it be? With Ripley's Believe It or Not, the Titanic Museum, and the Hollywood Wax Museum less than 0.5 miles away, your family won't have to go far to have fun. You'll love the award winning 18-hole course at Thousand Hills Golf Course, which is just 1.4 miles away. Your kids will love visiting White Water and Castle Rock Resort and Waterpark, both located less than one mile away. The Townhouses is a quiet escape barely off the beaten path in the Branson Theatre District, so plan to see at least a few that’ll have you humming the whole way home. Keep your day plans leisurely – like horseshoes-and-ping-pong leisurely – making your way to the pool at some point. There’s an outdoor pool and an indoor pool, so even if the weather isn’t cooperating, you can still get your swim on. Tennis lovers will definitely want to bring their racquet so they can get in touch with their inner-Serena Williams on the court. Little ones will have a blast on the children’s playground, and they’ll run off all of their energy just in time for their afternoon nap. Fully furnished air-conditioned townhouses sleep six guests, are warm and inviting, with spacious living/dining areas for passing your card-shuffling and dealing expertise on to the next generation. Good things come in twos here: each vacation rental is two stories, with two bedrooms and two baths. One kitchen is plenty, especially when it’s this well-equipped. Round up a couple of sous-chefs to help dice and slice, and recruit the others for clean-up duty (you’ll even have a washer/dryers in case things really got messy in the kitchen). Cable TVs with DVD players provide entertainment, let the kids each pick out a movie from home to enjoy. Map out the next day or two before the kids hit the hay and enjoy a relaxing soak in the jetted tub. There are sights to be seen, trails to be hiked and a lake to be fished and tubed. Skip the silent vote – that’s no fun. May the loudest holler-er win. You’re conveniently located in the Branson Theatre District. It features more than one-hundred shows; more than Broadway! The Titanic Museum has actual artifacts from the ship. Learn about the victims and survivors on a self-guided or private tour. Experience what it was like for passengers in first, second and third class aboard the Titanic. Check out the replica of the Grand Staircase. (This experience may be too intense for little ones). Silver Dollar City is a family theme park with over forty rides and attractions. Young riders will love the Grand Exposition Coaster, while big kids and the grownups will enjoy Outlaw Run. It’s the “world’s most daring wood coaster.” Take a family train ride, brave the White Water Rapids or the American Plunge. 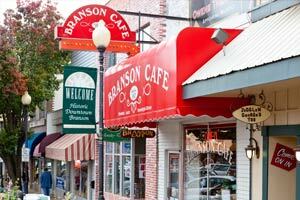 Branson, MO 65616. For more details, please contact the office using the information on the reservation confirmation received after booking.